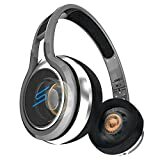 Amazon has the sms audio street by 50 cent wired On-Ear headphones - black for $165 with free shipping. Sells for $165+ Highest Price. Deals for $49 Lowest Price. Normally $107+.